View from a distance of Ely Cathedral. A Saxon Minster was founded here by St Ethelreada and Ely grew to be a powerful monastic centre like Canterbury and Glastonbury. The Minster was rebuilt after the Norman Conquest, started by Abbot Simeon and in 1109 Ely was made a Bishopric's see. Its status as a monastic cathedral allowed it to escape destruction in the 1530s when its monastery was dissolved. 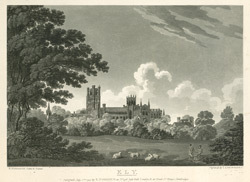 Daniel Defoe visited in the early 18th century and reported 'Ely, whose, cathedral , standing in a level flat country, is seen far and wide' and 'some of it is so antient, totters so much with every gust of wind, looks so like a decay, and seems so near it'.